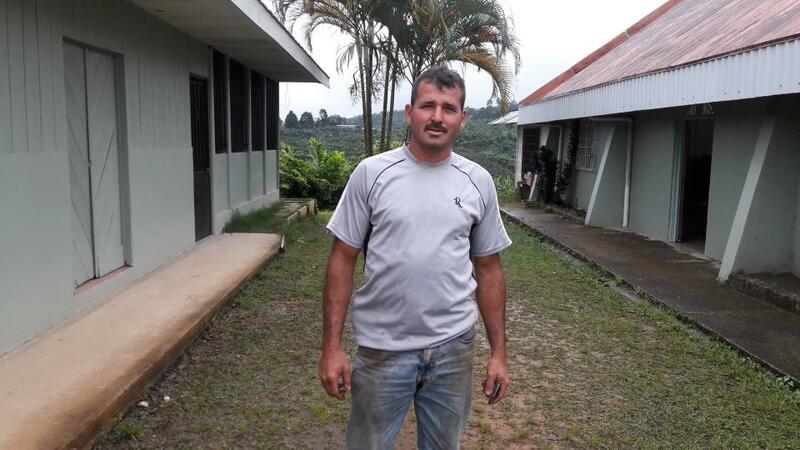 A loan of $925 helped to buy coffee seedlings. Alexander is 43 years old. He is married and lives with his wife and three children. With this loan he plans to buy some seedlings to replant when the rains begin. This will allow him to increase the density of plants by area. With these improvement to his crop he hopes to obtain some earnings, improve his living conditions and accomplish certain goals. This is his first loan from Fudecosur. He had no prior loan history with state banks, but Fudecosur has offered him a loan with better terms and a much lower interest rate. Alexander tiene la edad de 43 años, está casado, vive con la esposa y tres hijos. Con su crédito pretende comprar algunas plantas de almácigo para hacer resiembras a inicio de lluvias esto con el objetivo de aumentar la densidad de plantas por área. Con estas mejoras al cultivo espera obtener un poco de ganancias y así mejorar las condiciones de vida y también cumplir algunas metas. Es el primer préstamo que recibido de FUDECOSUR. Él no había tenido antes otros préstamos en bancos estatales, pero FUDECOSUR le ha brindado el préstamo con mayores facilidades y la tasa de intereses mucho más baja. It reaches rural borrowers that are considered too risky for traditional banks. FUDECOSUR works in one of the poorest regions of Costa Rica, where microfinance institutions (MFIs) are scarce or have a hard time keeping up with demand for small loans. By providing mostly agricultural loans, FUDECOSUR reaches rural borrowers that many MFIs consider to be too risky. However, this has also made it more difficult for the organization to find stable sources of capital to lend. Kiva's flexible, risk-tolerant capital plays a critical role in helping FUDECOSUR grow its portfolio and support even more borrowers. The Foundation for the Development of Southern Communities (FUDECOSUR) is dedicated to economically empowering its clients by providing credit and training programs that help improve living conditions for micro-entrepreneurs and their children across Southern Costa Rica. You can learn more about this Field Partner at fudecosur.org.